You are here: Home / Blog / 10 000 steps – easy peasy! I received an activity tracker for Christmas. One that you sync with an app on your phone and it tells you how active you have been during the day and even how well you slept at night. I had an inkling that my level of activity wasn’t quite what it should be, despite exercising every day. When you have an office job it is amazing how quickly the sedentary hours add up. So I set my tracker for 10 000 steps a day thinking that I would come close to it on most days. Oh my goodness I wasn’t prepared for the big dose of reality that came my way. No wonder the weight has been slowly creeping on! So it seems my half hour walk in the morning, followed by 30 minutes of strength training at home, only clocks up around 4000 steps. This means that I would have to do that workout all over again plus another 2000 steps to get to 10 000. Mmmm so how do I fit that into my day when I catch a train at 7am, get into work at 8am, sit at my desk until 4pm, catch a train home and walk in the door at 5pm, cook dinner, work on my own business until 8.30pm and then have some down time for an hour before heading off to bed. I always thought my hour of exercise in the morning was enough! Well it seems not; so now Claire Massingham it is time to walk some of your talk. Nothing like some facts and figures to tell you how it really is. What do I tell everyone? “If your health is a priority then you will make time to do what ever it takes to be healthy”. You only have one body to get you through this beautiful life so make sure you look after it! So this is what I am now striving for. I need to walk one hour every day which is equivalent to around 7000 steps (this is in addition to my strength training). I can accomplish this in one go on the weekends, but during the week it will have to be broken down into 30 minutes in the morning and 30 minutes when I get home from work. I am not going to complain about the grocery shopping on the weekend anymore because that is another 2000 steps walking up and down the isles and carrying shopping bags to and from the car. I am even going to park the car further away from the entrance. I am going to joyfully embrace getting hot and sweaty walking home from the train station in the afternoon, that’s another one thousand steps and during the day at work I am going to take every opportunity to get off my bum and walk around the office. I might even go for a walk at lunch time. Sitting for long hours is on par with smoking – it is seriously risky business. If you are like me and thought that your ‘once a day’ workout was enough you may need to think again, especially if you sit at a desk all day. At every opportunity get off your bum and move your body. 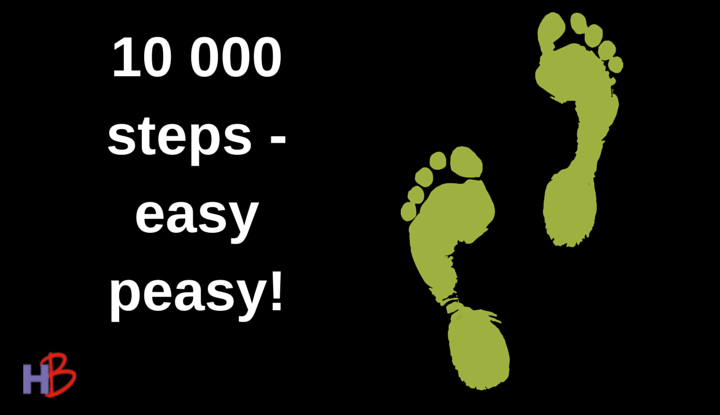 10 000 steps could make a huge difference both physically and psychologically to your health and happiness. Another very useful blog and some wonderful food for thought given it’s the start of a brand new year. I did a pedometer challenge a few years ago and found myself loving trying to beat my previous days efforts and you’re right it became easy. Incidental stuff like walking up starts, taking the clothes into the bedroom as I ironed them, and also mapping my journey around Europe so I could see where my steps could take me. It’s great to be held accountable for our level of activity and our health. thanks once more for the motiviation.